Sunrise Coal LLC is offering a lease form called the Allerton Coal Lease. Numerous experts have recognized that as the lease is written, it does not provide adequate protections to landowners. Vermilion County Farm Bureau sponsored a meeting on June 2nd, 2010 for the purpose of advising landowners to protect their interests. Attorneys reviewed the lease, section-by-section, and suggested changes landowners could make to protect their interests. Then, on June 29th Vermilion County Farm Bureau together with Champaign County Farm Bureau sponsored a second meeting at which landowners were advised by attorneys to protect themselves by obtaining legal representation if they had a desire to lease coal to Sunrise. The presentation detailed the risks to farmland and buildings that underground mining presents. Damage to farmland and its drainage systems always occurs, both with long wall, and room and pillar mining. The act of leasing, itself, can cause an immediate drop in farmland value. At its worst, mining can drive away farmers and convert a healthy sustainable agricultural community to an impoverished post-coal area. That is why it is so important that landowners stand up to coal by building protections into leases. We have the best farmland in the world and we need to protect it. 1. Limit the lease to coal only, and to specific coal seams. 2. Limit surface activities by limiting the number or location of roads, drains and waste deposits. You may want to provide for rental payments for the surface used. 3. Provide for the removal of structures the lessee mining company might want to install. 4. Do not waive compensation for damages now or in the future. 5. You may want to ensure that you will be compensated for damages by requiring that the mining company post adequate bond payable to you. Sunrise Coal LLC is structured as a small, stand alone corporation, thereby insulating its parent company from liability and limiting citizens’ ability to sue to recover claims for damage to property and/or water supplies. 6. Prohibit the use of “longwall mining”, which results in immediate and irreparable damage to flat farmland. Note that section 1 of the Allerton Coal Lease (Sunrise’s lease) excludes strip mining. It should also exclude long wall mining. Note that Section IVC line 4 “other underground method” should be deleted. The Line 5 prohibition of pit, strip or surface mining should be clarified by also prohibiting long wall mining. 7. Build in to your lease, the lessee’s (Sunrise Coal) absolute duty to leave the surface undisturbed with no subsidence. 8. Share equitably in coal royalty. Landowners own their coal. Insist that you are paid a fair share – 8% to 10% – converted to a fixed amount, rather than a royalty. Consider this: The Herrin coal formation in SW Vermilion County and SE Champaign Counties, at a thickness of 6 feet, and a 50% removal, assuming a density of 80 lbs/cu ft, yields 5220 tons per acre with a value of $261,000 when the market value of coal is $50/ton. The landowner’s 10% share is $26,000/acre. 9. Require that the water used to wash the coal removed from your property be treated using advanced technologies that prevent polluted discharges. 10. Require that Sunrise Coal and its successors follow all Illinois laws and all regulations of agencies charged with regulating the operations of coal mining companies, whether or not those agencies act to enforce their regulations. By your contract, transfer the burden of proof for following statutes and regulations to the mining company. 11. Require that the land you intend to farm be restored to its original condition and productivity whether or not any statute or regulation requires restoration. Note that reclamation means sowing grass on coal mine slag piles, while restoration means maintaining productivity and/or returning damaged land to original productivity. Note that Allerton Coal Lease Section V, item 5 will have to be rewritten. Note also that the ambiguity in Section VII D can be eliminated by requiring full surface restoration. Your farm’s pre-mining productivity can be documented with the help of records in the county offices of the Natural Resources Conservation Service (NRCS) and the Farm Services Agency (FSA). 12. 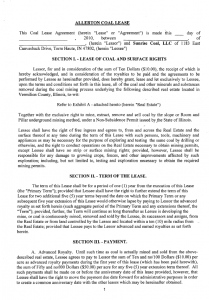 Write an effective provision for breach of lease that clearly gives you the right to cancel your lease for reasons that go unremedied for a reasonable amount of time. You may want to spell-out important failures that would constitute a breach. 13. Prohibit Sunrise Coal and any successor from storing ash from coal-fired power plants, coal slurry or any other material harmful to human health in the mined space beneath your land. Coal ash is toxic and can contaminate water. 14. Require that Sunrise Coal carry adequate liability insurance. The levels of insurance mentioned in Allerton Coal Lease, section XII are inadequate. Sunrise Coal LLC, is offering a lease form called the Allerton Coal Lease. Numerous sources have recognized that as the lease is written, it does not provide adequate protections to landowners. Then, on June 29 Vermilion County Farm Bureau together with Champaign County Farm Bureau sponsored a second meeting at which landowners were advised by attorneys to protect themselves by obtaining legal representation if they had a desire to lease coal to Sunrise. The presentation detailed the risks to farmland and buildings that underground mining presents. 1. The Allerton Coal Lease, section XII B tells us how Sunrise Coal, LLC could act to avoid the cost of cleaning up the mess that would result from mining and washing coal. – In Illinois, regulations to protect ground water are weak. – Effective regulatory enforcement by IDNR office of Mines and Minerals and by IEPA has not happened. (Statement by Robert Johnson, PE at the July 8 meeting held at Broadlands Immanuel Lutheran church. – Sunrise says it will “cleanup or otherwise respond to any asserted violation.” The reality is that Sunrise Coal, LLC knows ahead of time exactly how its actions can contaminate ground water and it would likely choose to proceed. – Then Sunrise Coal, LLC says it will take “all steps necessary to prevent damage to the real estate (how about to groundwater) in the future.” By then it’s too late! – Finally, when sued by landowners, and faced with a judgment and award of damages, Sunrise Coal, LLC would likely declare bankruptcy and vanish. Is that the reason Sunrise Coal is structured as a small Limited Liability Corporation (LLC)? Some of this game playing can be avoided by building protections into your lease. Talk with your neighbors. Ask your county officials for help. Consult your lawyer. 2. Require that Sunrise Coal carry adequate liability insurance. The levels of insurance mentioned in Allerton Coal Lease, section XII are inadequate. For other detailed comments on the Allerton Coal Lease offered by Sunrise go to the topic LEASE, with protections for landowners. The next step is to hire an attorney who is experienced and effective in negotiating coal leases.